The elusive Omura's whale has been recorded on film for the first time. Footage of the rare and little-known species was captured by an international team of biologists off the coast of Madagascar. Up until now, there had never been a confirmed sighting of the mammal in the wild by scientists and as such their numbers are unknown. The discovery is making waves in the marine community as up until recently it had been feared that the Omura's whale was extinct. Salvatore Cerchio, who led the research while at the Wildlife Conservation Society and is a guest investigator at the Woods Hole Oceanographic Institution (WHOI) said in a news release: . 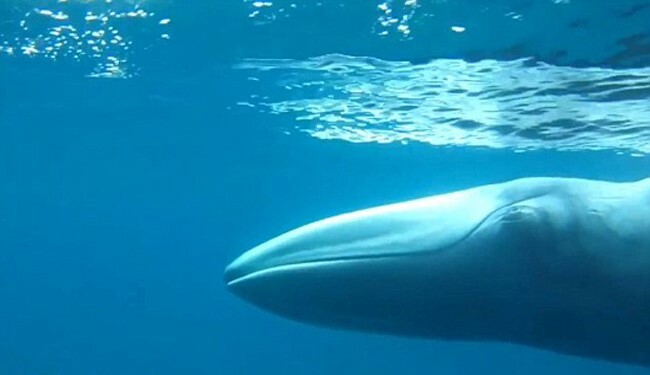 'Over the years, there have been a small handful of possible sightings of Omura's whales, but nothing that was confirmed. .
'They appear to occur in remote regions and are difficult to find at sea, because they are small-they range in length from approximately 33 to 38 feet-and do not put up a prominent blow.' 'What little we knew about these whales previously came primarily from eight specimens of Omura's whales taken in Japanese scientific whaling off the Solomon and Keeling Islands and a couple strandings of dead animals in Japan,' Cerchio said. . Responses to "The world's rarest whale is captured on film for the First time"
I just wish they wouldn't broadcast where it was found. If the animal killers find out it will go from rare to extinct. I hope they stay hidden. Seems to have the Orca white marking on it's back. DO NOT disclose it home range, fools. Don't tell the Japanese where it is! Be careful the dumbass trophy hunters will be after it.